Credo Reference: The Wikipedia You Can Use in Papers! If you sat down right now and did a Google search for anything in world, within the first five results, I’ll guarantee, lies a Wikipedia entry (go on prove me wrong … I’ll wait). And why shouldn’t it, for starters it is a free service to use, it is easy to use, and it is made readily available by search engines such as Google or Bing. Plus, let’s face it, it is kind of fun to see where being stuck in a wiki-hole might take you. But, while it is fun and easy to use, it is also universally frowned upon to quote Wikipedia in a paper or to cite it in the bibliography as a reference source. The reason that Wikipedia is generally frowned upon is that is an open access website meaning that anyone at any time can go in and create, modify, and edit an article without the assistance of an editor or a fact-checker. This raises multiple issues on not only the credibility and validity of the information but also where the information originated from. Sorry I’m late guys, I was busy pulling information out of thin air! But fear not! There is a resource out that is easy to use, free through the Library, and contains the same type of information as Wikipedia but does so using credible and cited articles from previously published encyclopedias and dictionaries. That resource is the Library database, Credo Reference, and it can be accessed using through Prairie State College at home on your couch, just as easily as it can be accessed from campus. Continue reading after the jump to learn more about using Credo Reference! You can also find out more about using Wikipedia as a student with this great article by PSC Librarian Sarah Slack or watch this informative video on using Credo Reference as an alternative to Wikipedia. While Wikipedia is a website where users can create and add-to encyclopedia-ish articles, Credo Reference is research tool that contains actual encyclopedia articles that have been published. To begin searching Credo Reference, simply type your research topic into the search box. After you submit your search, Credo Reference will bring you to a list of results. Each result tell you the name of the article and the encyclopedia or dictionary in which it came from. Along with how long the article is. Some topics will also have Topic Pages which are put together by Credo Reference. Topic Pages will give you both an overview of a topic along with additional resources you may find on the subject. To open up and read an article on a topic, all that you need to do is click on the title of the article. 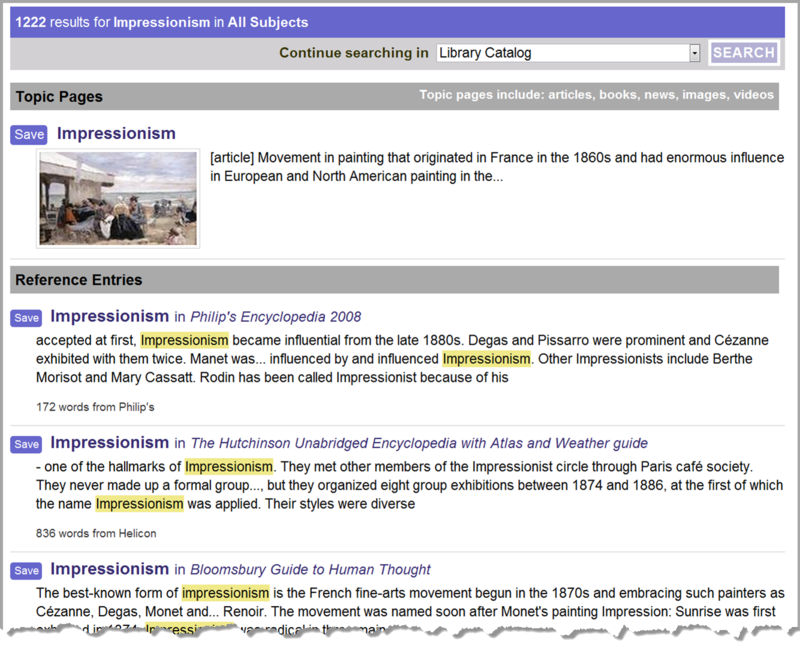 Similar to Wikipedia, articles in Credo Reference are hyperlinked, meaning that if you clicked on the link for Degas or Manet you will brought to additional articles in Credo Reference on the artists (careful about falling into a credo-hole). Additionally, the bibliography section at the end of the article is also hyperlinked so that you can view any references that were used. 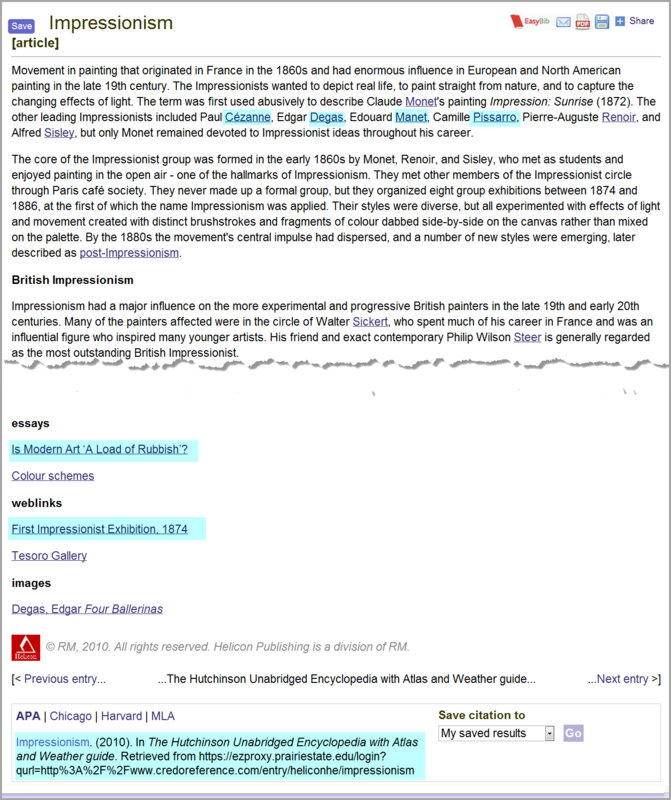 And finally, Credo provides it’s users with actual citation which you can use on your works cited/bibliography page. So, the next time you are thinking about using Wikipedia in a paper, try out Credo Reference and find a resource that you can actually use!